Our plans fall through. Unforeseen difficulties arise. We suffer because of other people’s choices. Often when terrible things happen, regardless of our innocence, we complain. We believe it right to call out for justice because our experiences don’t line up with what we thought would be the result. We’ve done everything right. Perhaps others taught us that a predictable outcome would always occur. At the very least, we thought the situation would balance in our favor. And then it doesn’t happen. Trouble finds us. Others punish us. Long-lasting ramifications plague us. And we suffer unfairly. It makes sense for us to complain. We generally hold onto a perspective of scale-balancing. If we do good things, then good things should come our way. Bad things should only come when we’ve done a certain number of bad things. In this mindset, the cry of foul rings when unfairly treated. But this perspective forgets one thing. The worst possible thing that ever happened was done to the best person who ever lived. The only person in the entire world who never failed to live up to God’s standard of holiness suffered the unabated wrath of God. Jesus’ death on the cross was the epitome of unfairness. Yes, he offered himself as sacrifice. Yes, this plan was formed before the world began. Yes, it was the whole point of the enfleshment of the Second Person of the Trinity. But it was also unfair. In 2 Corinthians 5:21, Paul writes, “For our sake he made him to be sin who knew no sin, so that in him we might become the righteousness of God.” The One who never knew sin, who never experienced it first-hand, who never was tainted with the rebellion that so easily entangles human beings. The best, holiest, most righteous person who ever existed. This One, God made the object of his wrath. The hell destined for billions of people, poured out on him in a matter of moments. Eternities of torment and separation suffered while on that cross. The eternity meant for every one of us, so that we who call on the name of Jesus can be made right in the sight of God. The debt of our sin paid through his suffering. How is it fair that the One who made the world, who created each and every one of us down to our very genes, suffered the torment of our hell, and the hell of every one who follows him? It’s not fair. But it’s loving. It’s just. It’s gracious. It’s merciful. It’s godly. 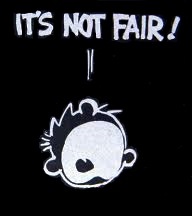 But it’s most certainly not fair. So, let’s put down this sense of scale-balancing fairness and pick up the justice of God. The justice where love means sacrifice. When we suffer unfairly, for the benefit of others, we look most like our Savior.